It’s something many of us take for granted: the ability to simply hop in the car and go wherever, whenever we please – to make a run to the grocery store when we realize we’re out of milk or bread, stop to pick up a prescription refill along the way, and pop in for an impromptu visit for a friend. But for those who are unable to drive, it can make independence and freedom a bit harder to come by. A large percentage of those who are disabled and/or elderly struggle with transportation issues and find it extremely challenging to leave home – in fact, according to the Bureau of Transportation Statistics, a staggering 3.5 million Americans never leave home at all. It’s reported as one of the top concerns for older adults, second only to health concerns. At To The Rescue, we’ve made it our mission to help older adults and those with disabilities to determine when and where they’d like to go, and ensure that they’re able to do just that, with safe, reliable transportation and accompaniment services. Provided by fully trained, experienced, cheerful caregivers, it’s possible for those who are homebound to have access to the many amenities in their communities and beyond. Unlike public transportation options, which require riders to arrive at a pre-designated time or to utilize unescorted taxi services with no specific attention to disability- or elderly-related needs, our caregivers provide professional assistance before, during, and after the individual’s requested outing, and are on hand according to each person’s particular schedule or routine. 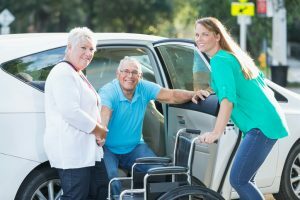 We provide help with getting out of the home and into/out of the vehicle, ambulation or wheelchair assistance at the desired destination, and settled back in at home again afterwards – with as much or as little accompaniment as needed or desired each step of the way. Doctors’ appointments, medical procedures, testing, etc. If you’d like to explore the enhanced socialization, freedom, and independence that our accompanied transportation services offer, or any of our other in-home care services, just give us a call at 720-851-2100 in Colorado or 319-826-6068 in Iowa.